With the Harper government signing the Canada-EU Trade Agreement which is expected to come into force in a year or two Canadian business leaders are reminded to assess their current strategy in anticipation of increased competitive pressure. A major free trade agreement such as CETA will change market competition by allowing new entrants into Canadian markets but also give Canadian firms improved access to foreign markets. Business leaders need to decide if they need to up their innovation game in response to increased rivalry. Canadian business competitiveness has been falling behind in recent years traced to Canada’s lagging productivity compared to the US. Canada’s lagging productivity has been linked to Canadian business leader’s failure to adopt innovation as a strategy. What are some innovation strategies and how can business leader’s select the right strategy for their industry/market? In their quest for above average industry profits business leaders can choose to find better ways to deliver their services or offer better products. The essence of innovation is in creating and capturing new value measured in terms of higher industry profits, improved growth, and strengthened competitiveness. Innovation can result from better products, processes, marketing methods, and business structures. Do Nothing Innovation Strategy – Management decides that their existing assets and competencies are appropriate to achieve acceptable returns in their markets. These markets are often protected in some form so competitive intensity is low. Adapt / Adopt Innovation Strategy – Firm’s imitate innovative business practices or acquire ‘off the shelf’ solutions that incorporate new methods or technologies to improve returns or defend returns. Business practices could include copying processes, marketing methods, and business structures used by rivals or leading firms in other industries. Acquired innovations could be embedded within capital equipment, tools, information systems. Acquired innovations could also include licensed technologies or methods. Incremental Innovation Strategy – Incremental innovation involves making improvements to existing products and services in terms of the relevant performance, cost, & quality measures for the market. Transformational Innovation Strategy – Transformational innovation involves making a step-change improvement to a product or service far beyond what incremental innovation can achieve also measured in terms of the relevant performance, cost, & quality measures for the market. A transformational innovation could also be demonstrated in a completely different way of structuring a business or a different way of marketing. Breakthrough Innovation Strategy – A breakthrough innovation involves creating a new-to-the-world market for a product or service. Firms can choose to adopt the ‘do nothing’ innovation strategy or one/several of the other strategies. Tactical actions and investments then follow the implementation of the selected innovation strategies. Although this diagram is simplistic it does help to make a gross strategic assessment whether the firm is investing enough in innovation to sustain company profits. As competitive intensity increases businesses need to invest more and take more risk to survive and thrive. First movers can gain a temporary market advantage with higher profits with increasing magnitudes and durations for incremental, transformational, and breakthrough innovations. Normal progress in industries can see adapt/adopt innovations become the necessary cost of entry for an industry rather than the source of differentiations. These industries drive industry participants to continually invest in innovation faster than some nominal rate of progress. A study by Curry & Clayton in 1992 revealed that the majority of Canadian firms employed an adapt/adopt innovation strategy. Benchmarking Canadian innovation performance with OECD peers since then has not demonstrated any improvement. Are your risk tolerance and innovation investments enough to keep up? Canadian business leaders are known to be risk adverse and underinvest in R&D (a proxy for innovation). Canada’s small market size, distance from global trade routes, proximity mainly to the US, business preference to remain local, low ambition, and trade protections result in mainly low competitive intensity in Canadian markets. Canadian firms who choose to export face higher competitive intensity. As globalization continues and trade barriers fall, new competitors will enter Canadian domestic markets and Canadian firms have the option of exporting more. Domestic and export competitive intensity will increase with the CETA and other trade agreements so business leaders need to decide if their traditional risk tolerance and R&D investment commitment will sustain their business in the face of this increased competitive intensity. Canadian businesses risk falling behind if they continue to be risk adverse and don’t spend enough on innovation to remain competitive with rivals. How fast is your industry changing? The rate of industry change or industry dynamics provides insight into their time horizon to adopt innovation as a strategy. 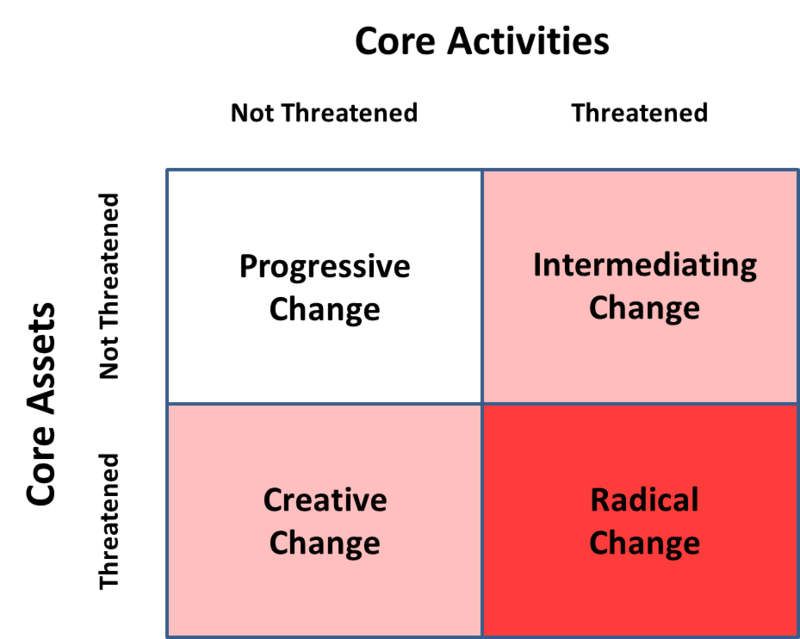 McGahan’s industry change diagram is useful to assess the magnitude of industry change and the degree of strategic response that may be required. The industry change model enables management to assess the degree of threat to the firm’s current core activities and core assets. Normal progress is experienced in the progressive change box with neither core activities or core assets threatened because competitive intensity change is slow. Adapt/adopt is often sufficient to survive in markets with progressive change. As industry change is directed towards improved processes and tools core activities and assets become threatened. 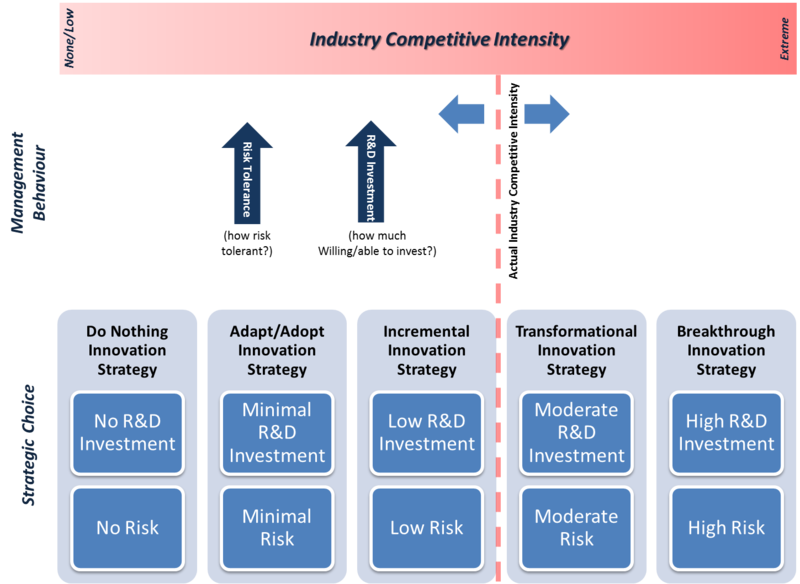 The incremental innovation strategy is usually sufficient to remain competitive but management must take larger risks and invest more in R&D to keep up with the competition. Radical change results if both the core activities and core assets of the firm are threatened such that the firm risks become obsolete rapidly. Transformative and disruptive innovation strategies are necessary to survive. This entry was posted in Innovation on October 21, 2013 by Andrew Reif.